Drive-in racks are primarily utilized for high density last in first out storage. Rails running the depth of both sides of the aisle are used to store / support the pallets. Drive-In Racks Systems have only one direction for entry. 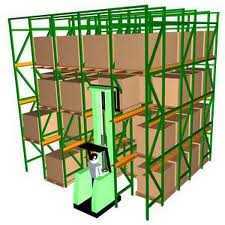 Drive-in racks maximize warehouse space utilization by reducing the wasted space utilized for aisles. For Drive-In Rack in Chicago, Illinois, and the Mid-West states CSI is the logical choice as a partner in meeting your Drive-In Rack storage and stagging needs. If you have standardized on a Drive-In Rack manufacturer, CSI can provide the manufacturer's Drive-In Rack you have standardized with. If you have not standardized on a Drive-In Rack manufacturer, CSI would strongly recommend Steel King and Speedrack as exceptional Drive-In Rack manufacturers with whom we have immediate access to a wide range of Drive-In Rack products. CSI provides Drive-in racks for high density last in first out storage applications (LIFO). IF YOU DO NOT SEE SPECIFICALLY WHAT YOU ARE LOOKING FOR, Contact us. We offer a wide variety of options, including offset front legs, reinforced posts, seismic designs, and more. If it is determined that drive-in racks will not assist in achieving your objective we have many forms of pallet storage for many different objectives and environments: Selective Racks, Flow Racks, Cantilever Racks, and more.